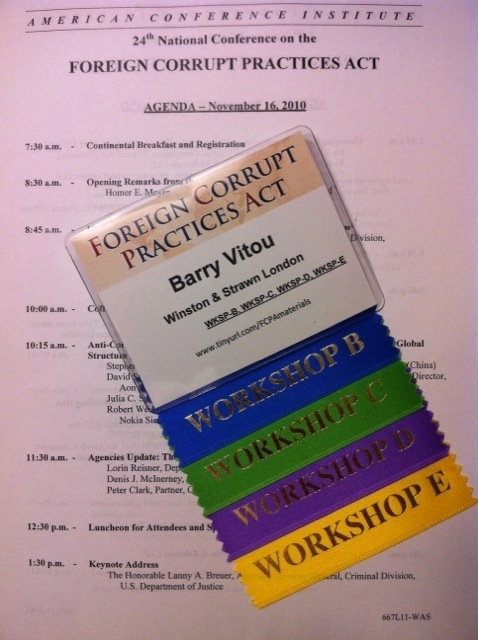 This week we are attending the 24th National Conference on the Foreign Corrupt Practices Act (if you are also here then say hello). Why when we are principally concerned with the UK Bribery Act? 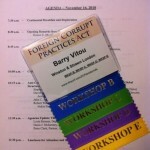 While the UK Bribery Act and the FCPA are not the same there are more similarities than differences. True, there are important nuances in the enforcement and application of UK law. However, the Bribery Act has the FCPA in its DNA. US enforcement trends are also a useful guide to where UK enforcement is headed and the US Department of Justice and the UK Serious Fraud Office are known to be in constant contact and share information about investigations. “International Prosecutors Panel: Conducting Multi-Jurisdictional Investigations: Law enforcement techniques, international agency cooperation and their obstacles”. 1. The new Dodd Frank Act in the US which includes provision for whistleblowers to receive a bounty. 2. Legislation proposed to debar organisations from government contracts from the House of Representatives (though we are aware that the impact of this proposal is itself the subject of debate!). 4. Changes to the US sentencing guidelines. One of the workshops related to gifts, entertainment and hospitality in high risk markets. This session also touched on the thorny question of facilitation payments. We were struck by the similarities discussed when it comes to the methodology in assessing whether corporate hospitality is likely to be acceptable under the FCPA when compared with the messages communicated by the UK’s Serious Fraud Office in its approach. In summary a healthy dose of common sense is the order of the day in both jurisdictions and we have written about this subject on a number of occasions from a Bribery Act perspective, for example here. Analysis must start with a review of local laws. Is what is proposed lawful in the place it is proposed to be given? Is the amount of time being spent on the legal analysis commensurate with the value of the hospitality? Under the FCPA there is a specific offence for failure to keep accurate books and records and so this aspect was dealt with comprehensively. While the UK has no specific similar offence it is likely that organisations wishing to avail themselves of the new defence of having “Adequate Procedures” to prevent bribery will need to demonstrate that they kept adequate records and transparency when it comes to corporate hospitality. Another tip: some organisations have undertaken a review of the laws of key jurisdictions to ensure that they have FAQ’s ready to hand when asked questions by operating companies. In the UK the continued ban on facilitation payments in the Bribery Act provokes heated discussion. Under UK law such payments are illegal and the Bribery Act does not alter the position: facilitation payments will remain illegal. The US position is often cited as a more practical solution. Yet, by way of comparison after participating in today’s sessions one thing is clear: the US position in relation to facilitation payments is far from clear. While the US does have an exemption in relation to facilitation payments many US corporates outlaw them as a policy matter. Acertaining whether or not a payment is one which falls into the US exemption seems to be a dark art; the answer, it seems, uncertain. Whether or not US law may permit such a payment under the FCPA is not the end of the story. In many cases irrespective of the US FCPA position local laws will prohibit them. Under the UK Bribery Act organisations are largely spared this problem since the SFO have said that they expect companies subject to the Bribery Act to impose a ban on such payments. While the SFO has said that they may pragmatic in respect of a one off lapse which is remedied it has said that it would be motivated to investigate in circumstances where a pattern of making such payments emerged. It is clear that organisations make facilitation payments at their peril and we certainly do not advocate them. One area which provoked a surprising (to us) amount of discussion today was the risk of assuming responsibility for a third party’s conduct in the context of FCPA compliance. After the coming into force of the UK Bribery Act and for companies subject to it this discussion will be fairly short. Under the new offence of failure of prevent bribery in Section 7 an organisation is strictly liable for the conduct (ie bribes) of those associated with it carried out for its benefit (irrespective of whether it actually knows anything about them). Who is an associate? Those who perform services for it. There is a defence: that the organisation had in place adequate procedures designed to prevent persons associated with it from undertaking such conduct. We have said before and will say again that when it comes to anti-corruption compliance the US and the UK really are two nations divided by a common language. Many lessons can be learnt from the US experience under the FCPA and organisations looking to comply with the UK Bribery Act next year would be well advised to keep a weather eye on the US. At the same time, UK law is subtly different from the US FCPA. Organisations who are FCPA compliant will need to take steps to update practices and procedures in order to comply with the new UK Bribery Act.